Why do most subwoofers fail to reproduce music accurately? One of the main reasons for this is that the driver is out of control. A conventional subwoofer is an open loop. The servo feedback used in Direct Servo completes the loop, and the result is a degree of control and accuracy that is not possible using any other method. Conventional subs have quite a number of limitations that prevent them from being true to the original. This is because conventional subs are open-loop systems. The amplifier can only ensure the signal at its output is low distortion. Between the amplifier output and the subwoofer driver is a pair of speaker wires whose resistance becomes an isolator between the amplifier and the load. The higher the resistance, the higher the isolation. 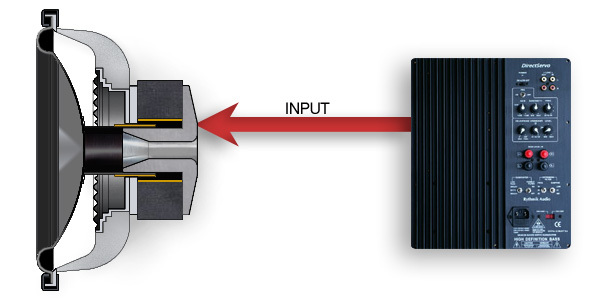 The above diagram illustrates a conventional subwoofer where the driver receives input from the amplifier but does not have a feedback loop. Those who are into big and fat speaker wires may think by using larger gauges, one can gain more control of the load. However, the reality is that the resistance of the speaker wires itself does not determine the level of isolation. Rather, it is the sum of the speaker wires and the voice coil that determines the isolation. To better explain this fact, we can model the subwoofer driver as an idealized driver with zero voice coil resistance plus an extra speaker wire with resistance equal to the voice coil resistance that can be lumped into the actual speaker wires. This way, it becomes clear that the actual isolation between the amplifier and the driver is the sum of the resistances of the voice coil and the physical speaker wires. When the speaker is ideal and completely distortion-free, this isolation does not pose any problem. However, when the speaker starts to create any distortion, it will start to generate distortion current. The voltage drop caused by this distortion current across the voice coil and speaker wire becomes an additional source of distortion. 1. Memory effects (both mechanical and thermal). 2. Frequency response affected by both voice coil temperature and signal level. The frequency response of non servo subwoofers depends on Thiele/Small parameters, and those parameters change with signal level. This dependency on the T/S parameters has greatly compromised the sound quality. For instance, in order to get the so called "correct" Qts from the driver to work with a vented box, manufacturers have often use excessive layers of copper wires in the voice coil. This practice not only weakens the motor strength by significantly widening the magnetic gap, it also makes the moving mass too high and increases the inductance. All of these design choices degrade the sound quality. Why do manufacturers continue to apply these design techniques if they have seriously impacted the sound quality? Because those drivers will be used in non servo subs, and the only way to convince customers they are the correct drivers is to make the Qts value look good on paper, regardless of how it is done. The following figure shows the connection between a Direct servo amplifier and its subwoofer driver. It is a closed loop system in which there is a servo (or velocity) feedback from the driver to the amplifier so the amplifier will linearize the velocity of the cone movement, instead of just at the amplifier output. At any time when the velocity signal deviates from the expected value, the amplifier will adjust its output to compensate for that. As a result, this arrangement offers additional distortion reduction that is not available in open-loop systems. 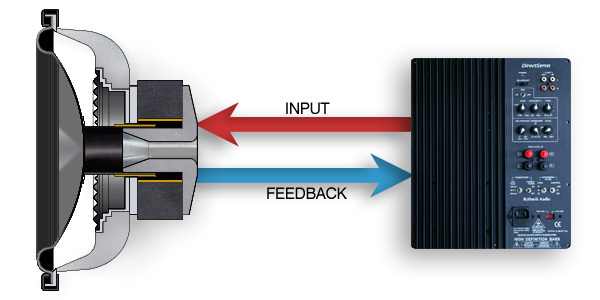 The above diagram illustrates a DIrect Servo subwoofer where feedback closes the loop. The above graphs (sealed boxes with 2.1cu and 4 cu ft internal volume, respectively) are NOT from simulation. They are near-field measurements of our DS1200 Direct Servo Sub subwoofers in actual enclosures. With conventional subwoofers, these two curves could have been very different, meaning the frequency response will be subject to the variability of the enclosure compliance (proportional to the enclosure size). However, with the closed-loop servo feedback, the frequency response from our subwoofers is almost identical for those two very different enclosures, which clearly demonstrates the correcting capability of servo closed-loop. Since the compliance of the driver is lumped with the enclosure compliance to become a single overall compliance, the above measurements also confirm the effectiveness of servo close loop to significantly reduce the impact of driver compliance. While the non-linearity of driver compliance can be treated as the variability of compliance value over cone position (or excursion), the above measurement also demonstrates the ability of the servo closed-loop to reduce distortion. The result is a consistent frequency response and lower distortion at the same time. For each model of our subwoofers, we recommend a particular enclosure volume to avoid over-excursion. That recommendation can be relaxed to +/-10% without affecting the frequency response at all.